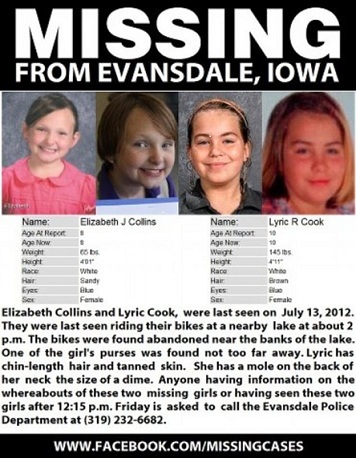 8 year old Elizabeth Collins and her 10 year old cousin Lyric Cook-Morrissey have been missing since Friday, July 13, 2012 in Evansdale, Iowa. Elizabeth and Lyric were last seen a little after noon on Friday in downtown Evansdale. The two girls bikes were located along a trail on the southeast corner of Meyers Lake. The girls never returned home and investigators say they have found no other traces of the missing girls. After the girls bikes and bags were found abandoned, the mother of one of the missing girls stated that she thought they were abducted. Just a few hours after the girls left, investigators found the girls bikes, and a bag they had with them, near the southeast side of Meyers Lake. Officials drug the river Friday before it turned dark. “We will keep searching until we are confident that they are not in that lake, ” said Captain Rick Abben, a Chief Deputy with the Black Hawk County Sheriff’s Office. A helicopter also patrolled overhead, looking for the pair. Abben said people searched the area until 3 in the morning. By Saturday afternoon, several different local and state law enforcement agencies and search groups were involved along with the FBI and National Center for Missing and Exploited Children. Officials searched nearby homes and yards, extending their search to the entire City of Evansdale, towards Deer Wood Park and other parts of Black Hawk County. The search continues for missing Elizabeth Collins and Lyric Cook. 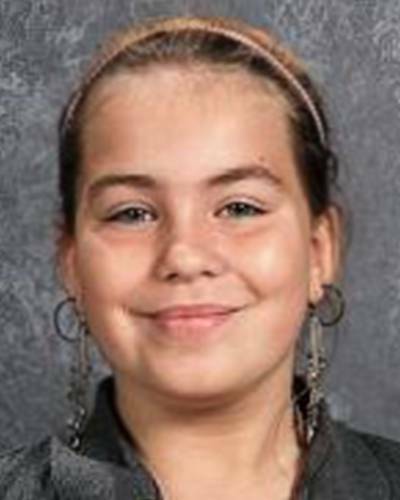 Thirty-three hours after two preteen cousins were last seen in northeast Iowa, authorities said late Saturday that the girls’ bicycles were the only sign of them discovered so far. 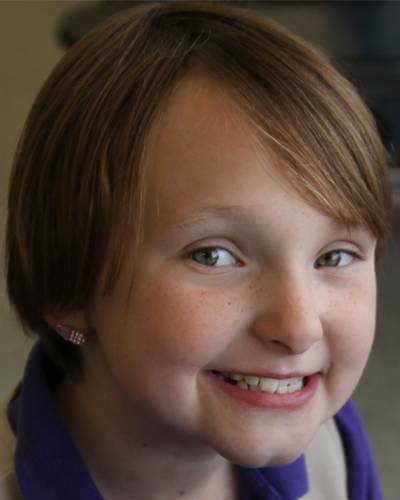 More than 400 volunteers helped comb wooded areas near Meyers Lake in Evansdale east of Waterloo throughout daylight hours on Saturday, but they didn’t find Elizabeth Collins, 8, and Lyric Cook-Morrissey, 10. UPDATE II: Evansdale police chief Kent Smock says his department is treating the case as “a suspicious disappearance” — meaning abduction is a possibility. Smock says Collins and Morrisey were last seen riding bicycles near Evansdale’s downtown area around 12:30 Friday afternoon. Their bicycles were later found along a nature trail next to a lake in a residential area that’s about a mile from where the girls were last known to be. Police and firefighters from Waterloo and several nearby communities — along with Black Hawk County sheriff’s deputies and the Iowa State Patrol – joined Evansdale authorities and dozens of volunteers in the search, which extended about four miles. With the aid of an Iowa State Patrol airplane, a privately-owned helicopter and boats, searchers dragged the lake and scanned the surrounding woods, a nearby creek and a city campground, but found no traces of the girls on Friday. Darkness forced authorities to call off their search after about five hours, but volunteers continued their efforts overnight. Anyone with information on the whereabouts of the missing girls or who saw Collins and Morrisey after 12:15 p.m. on Friday should contact Evansdale police at 319-232-6682. UPDATE IV: Crime blogger Blink from Blink on Crime provides analysis of the the missing persons case and comments on the area where the girls were last known to be seen. The area that might need to be searched is that where they were last seen, rather than the area where the bikes, backpacks and cell phones were found. UPDATE V: Summary from 7/15/23 Black Hawk County Sheriff’s Department press conference. For updates, comments, opinions and to provide your own, Go to Scared Monkeys Missing Persons Forum, Elizabeth Collins/Lyric Cook.